At least five people have been killed after suicide bombers tried to storm a courthouse in north-west Pakistan, police say. 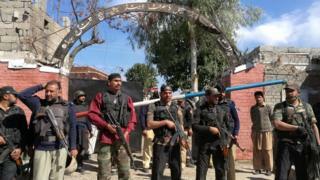 The three bombers were also killed and more than 15 people wounded during the attack in Tangi, Charsadda district. There was a 20-minute firefight at the gates to the courthouse complex. The Pakistani Taliban group Jamaat-ur-Ahrar says it carried out the attack, the latest in a number of bombings to hit the country in recent days. Pakistan's bloody week: Who is to blame? Will Pakistan ever stamp out extremism? In the latest attack, the suicide bombers reportedly threw hand grenades and opened fire as they tried to enter the court premises. They were kept back by police guards on duty and were eventually killed - two by their explosives belts, and the third by police. Five police officers were injured in the battle. One witness told Reuters he had seen "many" dead bodies. "I escaped towards the canteen and climbed the wall to save my life," said local resident Mohammad Shah Baz. "But there were many people dead and injured." Pakistan has been hit by a wave of suicide bomb attacks claimed by various Islamist militant groups in recent days. Police now say 90 people were killed when a bomber blew himself up at a shrine in the southern town of Sehwan last week in an attack claimed by the so-called Islamic State (IS). In response, Pakistan launched a security crackdown - which included closing border crossings with Afghanistan - and claims it killed 100 militants.